Just like children and adults sweat, so do babies -- even newborns. Newborns spend the majority of their day sleeping, and they are just as prone to sweat while asleep as they are awake. In some cases, the sweating is nothing to be worried about, but sometimes it can be a sign of a serious condition. Your newborn sleeps between 16 to 18 hours every day. This large amount of sleep is broken up into shorter periods of time, usually three to four hours at a stretch. During these times, your baby cycles between periods of drowsiness, rapid eye movement (REM) sleep, light sleep, deep sleep and very deep sleep. During periods of very deep sleep, some babies -- and some adults, for that matter -- are prone to profuse sweating, to the point where they wake up completely drenched. If your baby sweats during periods of very deep sleep, you probably have nothing to worry about. Strive to keep your baby warm at night, but be careful not to bundle her too warmly. Babies who are bundled in too many layers of clothing or even a single layer of clothing that is too warm for the environment will sweat, because the skin is unable to breathe. The rule of thumb for dressing a baby is to clothe her much like you clothe yourself, then add one additional layer. Avoid heavy quilts or comforters, which can cause young children to overheat. Your baby's sleep environment should be between 60 to 70 degrees Fahrenheit. Another reason to avoid overbundling your baby is that it is a key risk factor for SIDS, or sudden infant death syndrome. While most babies who wake up sweating are most likely enjoying long periods of deep sleep or responding to being dressed too warmly, others could be at risk for more serious complications. One of these complications is sleep apnea. This occurs when a newborn pauses 20 seconds or more between breaths. Sleep apnea is more common in premature babies, where it's called apnea of prematurity. Babies with sleep apnea sweat at night because they are working hard to breathe. Other symptoms of sleep apnea include a baby who gasps or wheezes when taking intermittent breaths, or has a bluish skin tone. Keep in mind, however, that young babies under 6 months of age naturally experience periodic breathing, alternating periods of rapid breathing with periods of deeper breathing. Consult a pediatrician if you suspect sleep apnea in your newborn. Just as babies who have sleep apnea have to work up a sweat to get a breath, so do babies with congenital heart disease. 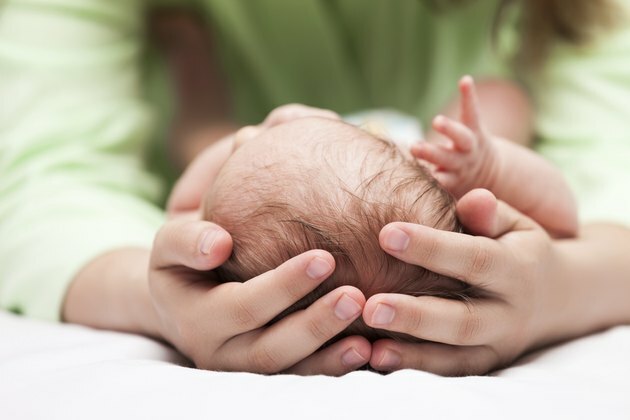 This condition affects as many as one in every 125 newborns. It happens when a structural defect forms in the heart while the baby is still developing in the womb. This defect may slow down blood flow, send blood to the wrong place or stop the flow of blood completely. Babies with a congenital heart defect sweat almost constantly -- while eating, sleeping and playing -- because their bodies have to work harder to pump blood efficiently. Other symptoms of this condition include a baby who struggles to breathe or eat, does not gain weight or has a blue tint to her skin. Tell your pediatrician if you observe these symptoms. National Heart, Lung and Blood Institute: What Are Congenital Heart Defects?